With our pool landscaping services in Mooresville, NC, we can enhance the aesthetics of your pool area. Pool Landscaping in Mooresville – Landscaping is one of the best ways to complete the overall look of the pool in your backyard. If you’re ready to turn your backyard into a real oasis, at Lake Norman Signature Pools & Patios, we encourage you to let us help you with the pool landscaping process. Whenever we work on a pool landscaping project in the Mooresville, North Carolina area, we plan out the design according to the specific needs of the pool owner. For example, if you want the area around your pool to be more private, we can surround your pool area with plants, shrubs, and trees that will enclose this space. At Lake Norman Signature Pools & Patios, we realize that there are some plants that are good for pool areas, and some that should be avoided if at all possible. For instance, it is a good idea to refrain from using fruit-bearing trees, plants with thorns, or plants that attract bees and insects in your pool landscaping plan. As we craft your design plan, we will make sure that the plants we incorporate will benefit the aesthetics and functionality of your pool area. 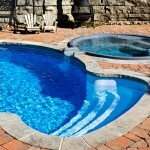 Once we complete your pool landscaping plan, we can then take care of the installation process. All you have to do is sit back and relax. At Lake Norman Signature Pool & Patios, we want you to fully enjoy having a pool in your backyard that looks like it belongs in a resort. To find out more about our pool landscaping services, please get in contact with us today. At Lake Norman Signature Pools & Patios, we proudly offer pool landscaping services in Mooresville, Cornelius, Davidson, Denver, Huntersville, and Lake Norman, North Carolina.